Review: Tyree's Chicago Vinyl label continues to roll out essential gems from the house pioneer's considerable vaults, with as much emphasis on new material as old. 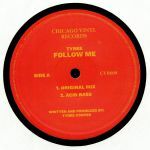 "Follow Me" definitely doffs its cap to contemporary house, not least when the vocal-peppered garnish gets stripped away to reveal the shuffling groove underneath. The "Acid Bass" mix takes things further with its moody, 303 flecked tones, while the "Dancefloor Rhythm" version makes things bounce around without a melody until a sassy piano lick comes in. The "Deep Bass Nine" mix completes the package with the trippiest offering of the lot, the low-end throb being the constant anchor while the rest of the track pivots and gyrates with its own unique approach to the fundamental elements that make up "Follow Me". 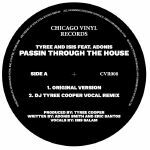 Review: A pioneer for the hip house scene in Chicago back in the 80s, Tyree is still at it thirty years later and sounding as vital as ever. This collaboration with Pure God is a thoroughly different concern to the jacking acid of the early days, bringing a live drum sound, funk bass and even a stirring string lilt into the mix on "Back Home". Whether you plump for the full vocal mix or the stripped back instrumental, it's an anthemic party starting beast of a jam for peak time maneuvers. The "Alternative Mix" of "Back Home" on the B-side is a more classic, throbbing slice of mechanical minimalism for the traditional Chicago jackers out there, and there's some "Bonus Beats" thrown in for good measure too! Review: The Chicago Vinyl series continues to act as a vessel for ever more essential club tackle from the one and only Tyree Cooper. On this occasion he's collaborating with celebrated vocalist Isis and the legendary Adonis for this absolutely storming tribute to the heritage of Chicago house music. The original "Passin Thru The House" is a consummate jack track, shouting out all the right names and letting the 707 fills rip through the groove. 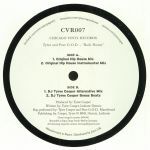 Tyree then offers up three alternate mixes of the track, from the bugging "Vocal Mix" to the uplifting melodious form of the "Vocal Soul Remix." There's an instrumental version tacked on if you need it, but it's all about Isis' killer vocal on this 12".